Office-Politics » I’m almost an MBA. I don’t want to be known as just a nanny! I’m almost an MBA. I don’t want to be known as just a nanny! I am currently 4 classes away from earning my MBA and earned my Bachelors degree a little over 2 years ago. And I have a dilemma. While working at a temporary position over the holidays, I began to network with some people. One of my new contacts originally approached me looking for a “nanny” but once we got to talking further, we realized that this new contact of mine had a full-time professional job opening in the career that I was looking to begin. It seemed like great karma!! After our initial contact, I followed up with her and reemphasized how anxious I was to hear more about this opportunity or other opportunities within this new contact’s corporation. About a week after the follow-up, this contact inquired if I was interested in ‘nannying’ and didn’t mention anything about the professional opportunity. Do I help out and take the nanny position temporarily and hope this contact still considers me for the professional career? How do I establish my self as a career-oriented professional and not just a kid? I want to be nice and help out with the nannying position, however, I don’t want to be known as just a nanny. How do I bring it up that I want to be considered for this position this contact said would open up in a few months? Any advice!? Thanks so much! I love the website!! And I would really like to see any answers or advice you have for me on this issue. P.S. The position I would like to pursue happens to be where this contact works and she mentioned having an ideal position for me opening up this spring. How should I redirect our conversations back to that? Think of the nanny position as starting you on the first rung of a ladder. You are going to climb higher and get more experience on that ladder. That’s good if you are interested in childhood education, teaching, raising your own kids, etc. But ask yourself if you really want to get to the top rung of that child-rearing-education ladder. Which ladder do you want to climb? If the ladder you really want to climb is in the corporate business world — the nanny ladder won’t help. And trying to jump from one ladder to the other could result in an embarrassing or damaging pratfall. You could prove me wrong, but in my opinion the nanny position is unlikely to lead to a professional opportunity. Don’t work as a nanny (unless you absolutely must to feed yourself.) You are far better off looking for a voluntary/low-paying opportunity in your field. That is experience you can add to your resume — not the nanny work. Read Dreamcrafting for a fuller explanation about the importance of getting your toe in the door in the field you want to be in. It is the best book I’ve read on how to design the life and career you want (despite having naysayers in your life who tell you not to try). I suggest you write a short note to the people who offered you the nanny job. Thank them for the offer — and then tell them — in writing — of your career goals and how you are looking for (almost) any opportunity to get your foot in the door at a corporation. It will also help you clarify what you want out of life and how you’re going to get it! How do you find new job opportunities? Join Twitter.com to connect with new people and expand your network. You can also use Google to find neat jobs that allow you to do cool stuff while building your resume. Go work for an innovative start-up and be paid peanuts. Open a lemonade stand (kind of joking)… but do something that shows that you’ve got fire in your belly and entrepreneurial ideas galore. Your professors might also be able to connect you to a low-paying but worthwhile starter job. A non-profit might burnish your reputation, allow you to give back to the community, and network you. In 6 months, circle back to those “nanny” people with a cheery update on your progress — no pressure just an “I-want-to-stay-in-the-loop-with-you” kind of message. It can take years to earn some people’s trust so that they are willing to connect you to an opportunity. Be patient. The best way to get her to put your name forward is to show that you are pursuing your own path — and other jobs in line with your career goals. And that you are not waiting for her to hand you any plums. She knows she mentioned that job to you but my advice is to explore other avenues. By doing that you will attract other opportunities — and increase her desire to ‘snag’ you. You want her to say to her coworkers…. Nice article. I would add: the woman will never offer a professional job if it would then mean she’d lose a good nanny! I agree! Very true. A good nanny is hard to find. Thank you so much for your immediate response. I like your thoughts and hopefully I will be able to put those words into action as eloquently as you wrote them 🙂 … I will let you know how it goes! You’re absolutely spot-on, Franke. Never, never, never take that kind of non-business job in hopes of transferring into the business. However, earning an MBA without 5 – 7 years of work experience since a bachelors puts a person in a difficult situation–but not insurmountable. It just takes longer to prove that you’re MBA quality. Keep networking like mad–and remember, job opportunities are usually thrice removed–a friend of a friend of a friend. In this economy, jobs may be four times removed. 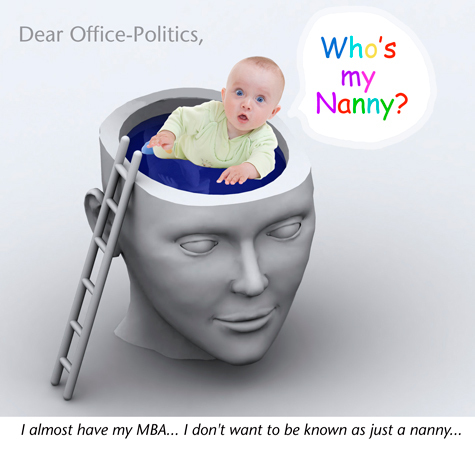 I suspect the professional with the nanny need will always see you as nanny-potential. Forget her! I think the important question to ask yourself is what do you really want out of this situation? Judging from your explanation, it seems as though you seem very enthusiastic and interested in the possible position that this woman could possibly have for you. Remember, she approached YOU about the position for nanny, and then the conversation went to the possibility of the other position. Stick with your intentions, thank her kindly for the offer in nannying, but do tell her that it is the other position you are honestly interested in. She will probably either be interested in talking to you further about the professional position, or it might be that despite your conversation, you might not be the right person for the job just now. Of course there could be numerous other reasons why it might not work out, but at least if you keep her aware of what your intentions are, you’ll get an honest answer out of her. One thing I wouldn’t recommend is taking the nannying position in hopes of reaching the other job. That will not yield any guarantees and if anything, you might find yourself feeling like you wasted your time. Best of luck and I hope that this job pulls through for you.